CATU voltage detectors are suitable for use on low, medium and high voltage applications including distribution, overhead line and transmission systems. The range of voltage detectors from CATU which include IEC rated, offer reliable and precise detection for maximum electrical safety. Detection is provided by double notification – audible alarm and flashing visible light. Detectors are used for varying voltages and applications and are rated for use on 3.3kV, 6.6kV, 33kV and above when determining if an overhead line or similar installation is carrying power and to what level. The Detex New Generation NG 917-EX, NG 917/2-EX and MS-920-EX are designed based on IEC 61243-3 rates, in response to the requirements of the EN 50110-1 European standard. The MS-917-VE NVT voltage detector is specially designed to check for no voltage and direct current voltages on electric or hybrid vehicles. CATU IEC voltage detectors are compact and light providing reliable voltage detection from 3.3kV to 33kV – compliant with IEC 61243-1 a standard applicable to portable voltage detectors. IEC 61243-1 voltage detectors are compact (59 Dia x 270mm) and light (420g) and suitable for indoor and outdoor use, CATU IEC voltage detectors are designed for use with medium and high voltage electrical cables and equipment. (*)Specify type of mounting when ordering: C or K.Packaging: unit supplied complete in a case with batteries and contact electrodes (straight and V-shaped). Total weight: 1100 g. Total size: 340 x 275 x 83 mm. *Delivered in vinyl sheath with wall brackets CI-06-D.**Delivered in canvas, waterproofed with ramp. CATU high voltage detectors (AC) provide reliable voltage detection for HV power cables, overhead lines and switchgear applications, 66-765kV according to IEC 61243-1. All CATU HV detectors are CE Marked and are suitable for detecting voltages both indoor and outdoor. Delivered in synthetic case with handle, battery and electrodes 370 x 165 x 145mm. (*)Please specify type of mounting when ordering: C or K.
Low or high voltage – is the detector required to test the power of a low or high voltage application. Are there any other detection instruments or electrical protection products required. What operating voltage does the product need to detect – voltage detectors are separated by their different operating limits. Typically, voltage detectors are used in conjunction with insulating gloves or an electrical hot stick. This is to ensure the operator is fully protected against any live electrical power that is still present or if the cables are live. 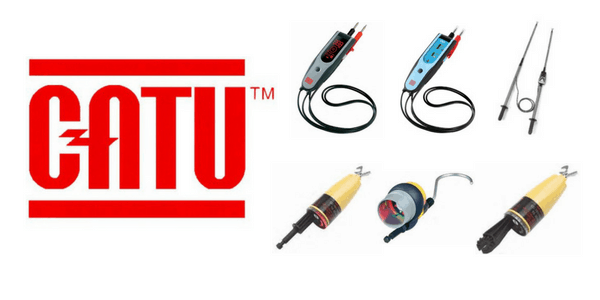 CATU provide a complete range of Electrical Safety Equipment including insulating ladders and insulating matting for medium and high voltage electrical protection.